An outlet for news and info on McEwan-related books, online features, audio-visual materials, and other miscellaneous and/or curious items. Ian McEwan has demonstrated a remarkable interest in the problem of evil from the very beginning of his writing career. yet, he is not focused on the anthropology of evil but is primarily attracted to the epistemology of evil and the presentation how this encounter is reflected upon the lives of his protagonists. The structure of McEwan's novels is based on the process of initiation which his naive and inexperienced characters have to undergo. This initiation brings them the newly acquired maturity. As the nine analyzed novels (The Cement Garden, The Comfort of Strangers, The Child in Time, The Innocent, Black Dogs, The Daydreamer, Enduring Love, Amsterdam, and Atonement) show, love proves to be the only force which can bring atonement and rebirth. Order a copy online via the publisher Universitätsverlag WINTER. Ian McEwan's work is paradigmatic for the intricate relationship between art and politics in British fiction. Whereas his early work is more concerned with the family and its perversions, there is a definite politicization after The Comfort of Strangers (1981). The years between McEwan's Venetian novel and The Child in Time (1987) was a period of gestation: he wrote the libretto Or Shall We Die? (1983) and the script for The Ploughman's Lunch (1985) taking up nuclear disarmament and Thatcherism. McEwan saw these works as A Move Abroad (1989) and returned to the novel with the caustically political The Child in Time. All his later novels have strong political undertones most drastically visualized in The Innocent (1990): Otto's mutilated corpse as an image of Berlin. In Saturday (2005), the mass rally against the Iraq War in 2003 is the background against which the Perowne's Bloomsday takes place. 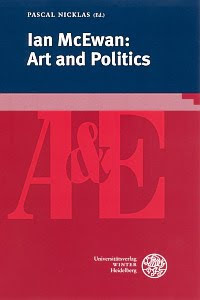 Similarly, in Black Dogs (1992) or Amsterdam (1998) politics are shown in their complex relationship to art which is also celebrated in Atonement (2001). Ian McEwan Website -- Now on Facebook! The Ian McEwan Website now has a page on Facebook. We hope this page will serve as a useful and interactive supplement to Ian's official website and that fans of his work will join and participate by posting their thoughts, etc. Anyone can view the posts, so have a look!